It’s 25°F this morning here in southern New Hampshire while up north it has dropped to single digits. There is snow forecasted for tomorrow and Friday. Good thing we put the snow stakes in yesterday. 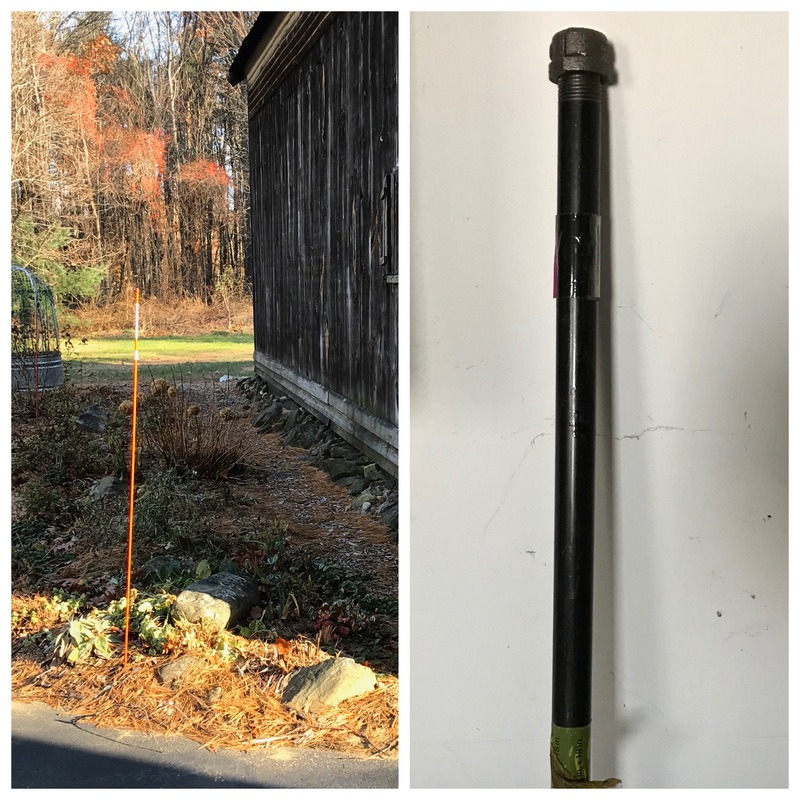 If you use the orange plastic snow stakes instead of wooden ones, consider this tool my hubby made to help get them in the ground. He took an 18″ piece of pipe, added a cap, and we fit that over the orange stake and pound away just like a fence post driver. Works great. But, today the sun is shining so I’ll enjoy that while I do a little quilting. I’m working on a wall hanging with some history to it. Back in the 1970’s, my Mom made me some candlewick embroidery pieces that I made into throw pillows. Along the way, I cut the panels off and stored them. I ran across them recently and decided I’d better do something with them. I had five panels, not all in great shape, but they make me smile because I know she put great effort into making them. I added four panels with pansies appliquéd on them to give me a total of nine to work with. Pansies were her favorite flower, and blue was her favorite color. I’ll be sure to show the finished product. Transitioning from being outside in nature every day to enjoying being inside is challenging for me. I even have to work at blogging because this time of year, my idea bank gets kind of low. I’m busy on the computer every day for hours at a time, but that’s work for Master Gardeners. I’ve been updating the website, doing twice weekly blog posts, handling Instagram and Facebook, working on a logo, and creating a slide show for our December meeting. But, alas, no real gardening. I know my blogging friends in Australia are gearing up for summer, and those in England and Ireland aren’t totally done, so tell us – are you still gardening or are you transitioning to winter activities as well? This entry was posted in New England and tagged Gardening, Quilting, Snow, Snow stakes, Winter. Bookmark the permalink. I find the transition challenging too and never look forward to the snow. That project looks interesting, though. Let us see how it develops! Good luck with the snow Judy. Your pansy appliqué is lovely. I did a bit of candlewicking once from a kit my sister gave me. She offered to make it into a pillow when I finished, but years later I donated the unfinished piece to the thrift shop, hoping someone would take it on. 20deg here this morning on LI, NY so time to do fall cleanup outside! Goodbye annuals! Glad I picked the last roses yesterday. But I still can’t bring myself to cut perennials back to ground level. Some, like astilbe, I leave all winter to give a little shape to the perennial beds. Bring in the furniture and ornaments, and the hoses, start tidying the garage so I can maybe bring the car in when heavy snow is forecast… we may be a month or more behind you, but the work still has to be done! Enjoy your quilting! Rain is forecasted for central Maine for tomorrow. Weird how that varies. Not quite ready for winter, but getting closer. Guess we’d better hustle. Pansies are one of my favorite flowers.The one your mother did is so lovely. Thanks, Judy. Coming down the homestretch. Judy, those candlewick pieces from your mom are treasures. My Great Aunt Emma could do anything with a needle and thread. One of those things was candlewicking. How I wish I had just one of those pieces today. 😢 Can’t wait to see the finished product when you add your talent to your mom’s. Snow shovels, sand, pet friendly ice melt, ice chopper are already on our back deck (enclosed) and patiently waiting to be used. Me? I hope they never get touched! 😡😡😡😡 Rain moving in later today into tomorrow….but requires no shoveling! I’ve done some “putting away” til next spring and tossing out. The squirrels had a field day with several of my chair cushions ripping them open for the stuffing! I’ve had to toss all by one seat cushion and 4 back cushions. Lord only knows if I’ll be able to find replacements next year? I also tossed a big outdoor umbrella because one of the spokes broke. 😭 I’m letting the fallen leaves pile up on the planter boxes hoping as always that will help keep the weeds down. It doesn’t but hopefully, it feeds the soil. My Camillea (sp) is just about totally dead, and our flowering Plum is dying too. We’re going to have to figure out what is going on in that planter box. The agapanthus and daisies are doing well as do the weeds. It’s maddening not being able to save the trees. 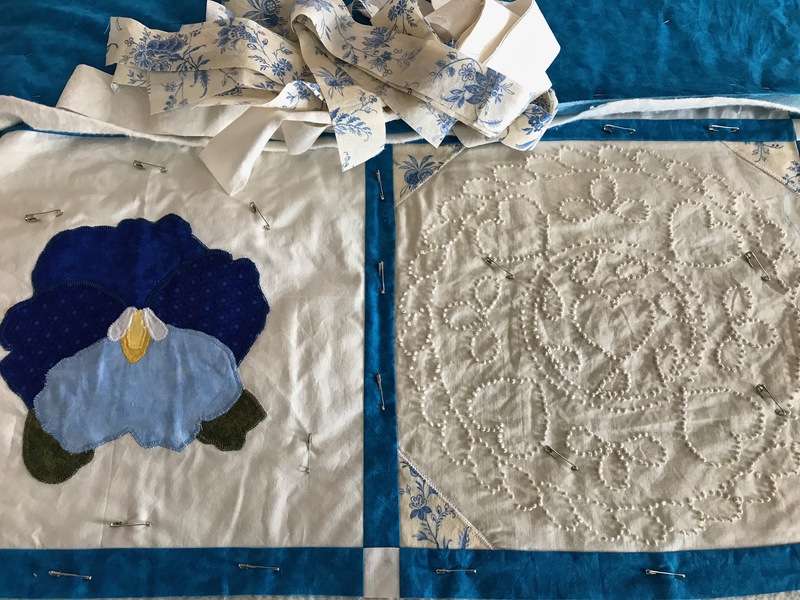 Your new quilting project sounds lovely and it’s coming along. I wished I’d saved more of the lace, and bit and bobs I had of my Grandmothers. I could have cut the good bits off and framed them. I have a few things left that I’m keeping for doing that someday. I’m looking forward to seeing your finished piece. Squirrels – now there’s a topic. 🙂 I was talking to a gentleman last week who is in the pest business. He said that last year there was such a glut of acorns and other nuts and berries that the population exploded. The only problem is this year there isn’t enough natural feed for any of the wild animals and so they are heading to our homes to take up residence. He said the squirrel business is booming at about $1,800 per home to attempt to seal it up and capture them. He’s also a hunter, and he normally hikes into the woods about a mile to find deer, but this year he said he just drives into the field and waits. I know lots of folks think they are cute and love taking photos of them, but they can be very destructive and cost a homeowner lots of money to repair damage. I hope you find some cushions on sale next year. 🙂 Yes, this is a project close to the heart, but I could use some more quilting skills to really pull it off. But, I’ll give it my best shot. Squirrels are cute but they can do some damage. I’m not ready for snow! Hopefully, anything we get will melt soon. I’ve been trying to get outside to putter around as much as I can when the sun shines (not enough), and walk the trails every day. But I, too, spend more time sitting at the computer or reading these days. My body doesn’t like that! Hi Judy! Just curious about the snow poles. What are they for? I live in the Sierra Nevada and I’ve not seen a homeowner use them. The county does use them on the roads though. Curious minds want to know…. Thx Judy for your response. We actually should probably use them in our driveway. Our block wall does get hit sometimes by the snow plow. Although at my elevation we typically don’t get more than a foot or two of snow and it melts off within a few days. Cheryl, thanks for asking this question. I was wondering also. Judy, your answer makes perfect sense. How tall are they, and do they ever get covered over? We just had the leaf vacuumers come and remove some millions of leaves. We have a few roses left, but it’s too cold for gardening. Whether we are getting rain or snow depends on which meteorologist you watch. So far, they are predicting rain but snow isn’t impossible. I am so unready. Sprinklings of morning snow here over the past week – everything gone by noon, though. I’m too busy getting ready for Thanksgiving to really care. Yet. As I age, I really start to resent the cold, the early darkness, and the danger of ice. I will probably hibernate with quilting all winter. I remember when candlewicking was first reintroduced in the 70s. I always wanted to try it, but that’s when I began to self teach myself to quilt and there was no time. I love the way you are making mom’s hand work into a nice piece for yourself – a sweet way to respect her hand work and keep her memory right there with you every day! Looking forward to seeing the completed project – which I assume will be a cozy lap quilt? Your new/old quilt is going to be beautiful and a treasure. I’m looking forward to seeing it when you’re done. What is the purpose of the snow stakes? Here, we’re not far away from the start of summer. We’ve already had one blast of very hot weather, with a week of 35+C temperatures. Now it’s back to more normal spring temps. I’ve discovered a new liquid fertiliser called Powerfeed. My roses love it and are covered in buds. I’ve put in some pretty pink double petunias and some Marguerite daisies in different colours to build up the border of my rose garden. It’s starting to look pretty. Some rain would be good now. We have another brand of fertiliser called Charlie Carp. It is made from European carp which are an introduced species and a pest in our river systems. It’s a great way to dispose of the fish and does wonders for Mr ET’s vegie garden. The winter is long so we might as well pick up projects to keep us busy. I started taking art/painting classes about a month ago as I’m transitioning into the long winter indoors. I’ve always thought I didn’t have an artistic bone in my body, but my art teacher is doing a good job of proving that ANYONE can be artistic … including me 🙂 So that’s my ‘project’ for the winter. I think at some point I may just end up recycling my canvases and painting over them. No real gardening but it sounds like you have a full plate. I like your hub’s tool. I use a piece of pipe to guide the stakes but that might work even better. Thanks for sharing that tip ! I took advantage of this nice day. We have freezy-yuck in the forecast for Wed-Thur and rain on Friday. Thanks Judy. I got up to the last row (and a half), which requires staging and some long cuts. It was too late to start setting up, and I had to load a lot of stuff in the dumpster. I feel very good about the progress. Maybe 2 hours on the side, and then the area by my shop door. Saturday looks to be a nice day. Fingers crossed. We have been waiting for the weather to get cold so that we can cover the nursery rows. Today was the day! Down vest, hat, scarf, and warms socks all needed today to finish the chore! So, a little transitioning still before the snow flies and we are truly forced in for more indoor work! Hi Judy, We always use a thick landscape cloth. Our old ones are wool ( really!) but in the last twenty years we have used a micro film cloth that is a bit spongy in design. Tarps would not be my first choice. I don’t think there would be much insulating value in tarps. Row cover like remay would also be a little too light for my liking. I think if I didn’t have the landscape cloth, I would be inclined to use straw or leaves. The disadvantage of this is increasing the vole/mole /mice population. We do use a castor oil mixture on the plants before covering and this helps a great deal in keeping the varmints at bay. How about Fernwood comes and does a presentation at your Mg group? If I am ever traveling in the beautiful state of New Hampshire!! Would love that! No snow in Houston but the temp is said to be dropping to the 30’s the next 4 nights. That’s surprising for this time of year. The quilting project looks like a sweet endeavor for the pillows and you ❤ Love that. We do not use snow stakes, (relative to my not hating snow.) We've had two snows but they didn't stick. One was nearly invisible. It's cold now though. I don’t envy you the long winters…. I seem to get creaky in winter! Our spring seems to be racing into summer here, which is not a good thing… Summer is too hot! Happy quilting Judy .. I love pansies. That quilt is going to be a wonder. As you know, such things are way beyond me, and I marvel at your skills. I got some serious raking in over the weekend, and removed the defunct pansies and mums that used to look good by the front door. We might see snow this week, but probably not much. As to winter projects, right now I’m mostly scratching my head and wondering where to start. My first year in this house is accomplished, and projects loom everywhere! I think gardeners have a certain madness approaching winter, compulsively wanting to keep their hands busy. We go mildly insane until late winter, when we go totally insane. Like yours, our weather has turned. I need to pull up and compost the ornamental kale and a few other things and store the pots but that’ll be that for outdoors. I like indoors, too, though–I have cinnamon-y granola in the oven and lots of books and weaving to last me through the cold days. I love the “new” quilt project you have in the works! We’re in the transitioning phase of gardening right now. We’ve trimmed most of the big bushes and done our fist raking of the leaves, but there’s more to do. I worry less about putting the garden to bed for the winter than I used to. On the other hand, I now fret more about getting all the pots and chairs stashed away in the garage and basement. Still, overall I enjoy the whole yearly gardening process and am glad that we make the effort. Your wall hanging is going to be beautiful when it is all done…I can’t wait to see it. I think you mother is smiling as you work on this with not only her favorite flower but color as well.